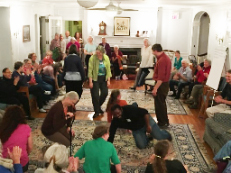 Welcome to the summary page for New York Yearly Meeting's 2015 Fall Sessions. See the table of contents below for documents related to Fall Sessions 2015. See also the sidebar to the left for links to some documents. We approved By-laws for New York Yearly Meeting as a corporation. We approved the 2016 Budget. We heard first readings of several Handbook pages (see below). We signed on to a letter addressed to heads of state and parliamentarians attending the Conference of Parties of the United Nations Framework Convention on Climate Change in Paris (COP 21). We were introduced to two Friends assuming some of the roles of our Young Adult Field Secretary, who is on medical leave: Emily Provance will work with young adults and their meetings, and Jillian Smith will handle communications and media. Note the table of contents to the left, available from all Summer Sessions pages.